Style classes that have been defined in the Design module can be assigned here. Displays the name of the selected style class. 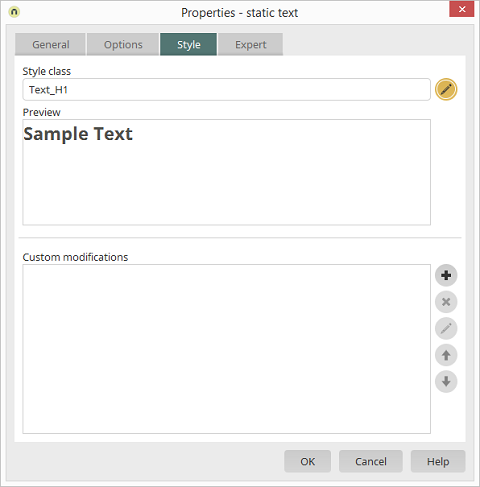 Displays a preview of the selected style class. Opens a dialog where you can select the required style class. All CSS modifications are listed here. Opens a dialog where a new CSS rule can be created. Removes the CSS rule from the list. Opens a dialog where the CSS rule can be edited. Adjust the order of the CSS rules. Custom styles are only available for the application and not portal-wide (e.g. when you customize an element on a view page for the global search).